This is one of my favorite quick and easy meals. Everything cooks in one skillet and with an array of toppings everyone can make their serving to please. The main filling of the dish is chorizo and pinto beans with Tex Mex Style fire roasted tomatoes added for extra flavor and moisture. This would also make an excellent meatless dish, just sub one cup cooked rice for the chorizo. Place a skillet over medium heat. Remove chorizo from casing, break into bite sized pieced and cook until browned and cooked through. Add the beans and tomatoes and simmer for 5-10 minutes or until heated through. If using rice instead of meat cook the rice, beans, and tomato mixture for the indicated time. 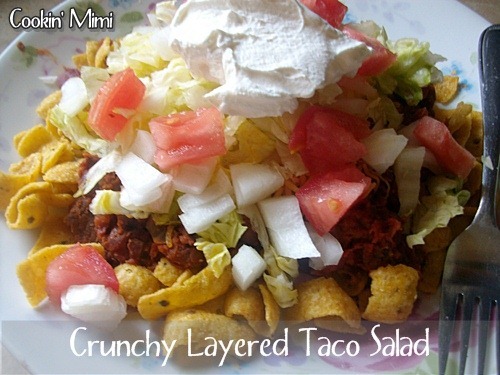 Divide the corn chips among 4 plates, top with the bean mixture and layer toppings as desired. I go through these phases with pizza and tacos where it’s all I want to eat. Right now I’m on a pizza kick but sure enough a taco one will be here soon and I will remember this one! This is similar to nachos we make with soy chorizo! We haven’t made them in a while and now i think they may need to be on the menu this week, looks fantastic!